Provident Label Group/Sony Music proudly announces GRAMMY®Award-winning artist Zach Williams has released a special EP today, titled Survivor: Live From Harding Prison. 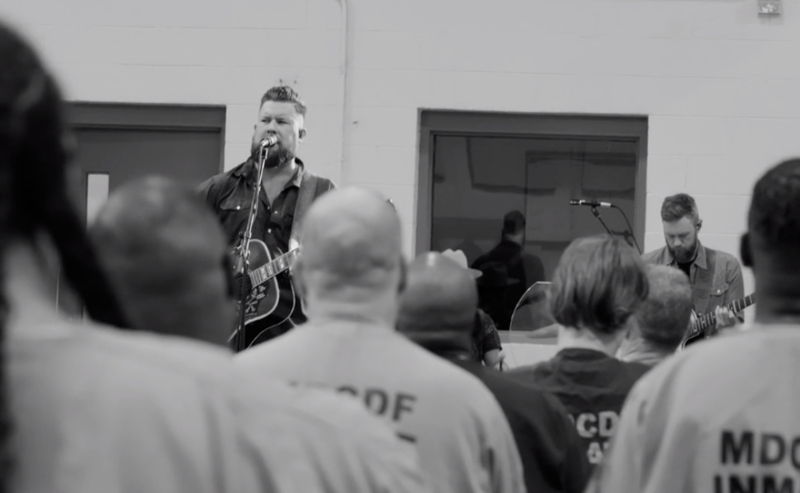 The six-song project was recorded live earlier this summer from the Nashville-based prison where Williams and his band performed an acoustic set of his hits, along with Bethel Music's "No Longer Slaves," for 250 men who are currently incarcerated. The project was produced in partnership with local non-profit, Men of Valor. The project is something that Williams, who first made his name in 2016 with his record-breaking and award winning single "Chain Breaker," has been wanting to do for years. "As a songwriter, seeing God use the songs I write and my experiences to show His grace to others is one of the biggest blessings I have ever received," Zach Williams shares. "A little over five years ago, I visited a prison in Arkansas with my wife and shared the story of what God was doing in our lives. What I experienced that day is something I will never forget. God broke my heart for these men and women. They had, ultimately, just made bad decisions which is something that I completely related to, and for me, that experience gave a whole new meaning to the word ‘grace.’ Ever since then, I have felt a calling to share my music and stories with men and women in prison in the hopes that lives can be changed by the power of the gospel. My prayer is to see chains broken and walls shattered. God has a plan for each and every one of our lives but we have to fully surrender to the Cross before those plans are revealed." Each song featured on the project - "Survivor," "Old Church Choir," "To The Table," "No Longer Slaves," "Fear Is A Liar" and closing with "Chain Breaker" - was filmed, along with interviews with some of the inmates sharing their own personal testimonies. Video footage will release weekly on Williams' YouTube channel. Additionally, a devotional will become available in the coming weeks through YouVersion, was written by a pastor with Men of Valor. Men of Valor, which began in 1997, reconciles incarcerated men with their families, to society and to God by providing aftercare and re-entry services 24/7. Through encouragement and support, these and training efforts help the men become productive, responsible citizens who then become good husbands and fathers. The aftercare and re-entry services are the reason that the recidivism rate for men who complete their one-year program has stayed at or below 15%. For more information about Men of Valor, please visitMen-of-Valor.org. Curt Campbell, Program Director for Men of Valor, shared, “There is a window of opportunity when a man or a woman is incarcerated to impact their lives in a way that can dramatically affect how they re-enter society. This is a growing segment of our society where the fields are truly ripe for harvest, but where the laborers are few. Thank you, Zach, and the rest of your crew, for acknowledging this need, embracing the opportunity, having a heart for these men and making a difference! Like these men, I am greatly encouraged by those in society, mostly God’s people, who have not 'thrown away the key' and forgotten them." Williams concludes, "I want to say a special ‘thank you’ to the men of Harding Prison in Tennessee for being a part of this record. It was an honor and a privilege to share my heart with you. Thank you so much for allowing an outsider in. Through God, there is truly freedom behind bars. Through Him and only Him, we are survivors." AMA'S: It was just announced earlier this week that Zach Williams was nominated for an American Music Award. Receiving the honor in the Favorite Artist - Contemporary Inspirational category, winners will be determined entirely by fan votes. The awards will be held live in Los Angeles on October 9 on ABC. For more information, visit VoteAMAs.com. MUSIC: When it released in the early fall of 2016, "Chain Breaker" was an instant hit, holding the No. 1 spot at radio for an astounding 15 weeks. The song was then followed by "Old Church Choir," which became the most successful Christian radio single in over a decade, maintaining No. 1 at radio for 20 weeks and was the second longest running No. 1 single in Billboard's Christian radio history, naming Williams the first debut artist to have two back-to-back No. 1 singles. His third single, "Fear Is A Liar," reached No. 2 and the most current song to go to radio, "Survivor," goes for adds this Friday. The songs are all featured on Chain Breaker, Williams' GRAMMY® Award-winning debut LP. TOURING: After headlining his own tour earlier this spring, Williams toured throughout the summer and continues this fall and winter around the U.S. He is performing on the Air1 Positive Hits Tour throughout the rest of this month and into October, and will hit the road with labelmate Matt Maher for several dates in late October and into early November. Williams is also slated to appear on The Little Drummer Boy | The Christmas Tour with for King + Country in December. For the most updated schedule please visit his tour page.